Since 1954, Clarke Engineering, Inc. has been a leader in Southern California in the production of gears for aerospace and commercial applications. The company has been awarded the Outstanding Supplier Service Award by a major aerospace manufacturer. 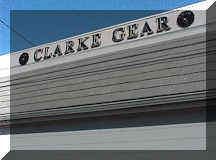 Clarke became the first gear company internationally to achieve AS9100 Rev C certification in 2011 and Rev D certification in 2017. "To provide the highest quality product and service to our valued customers, utilizing our years of experience and state-of-the-art equipment in a cost effective and timely manner." Commitment to Our Customer: To continuously improve our products and services beyond the expectations of our customer and provide cost effective solutions to their applications and needs. Commitment to Our Employees: Clarke Engineering is committed to the empowerment and ongoing development of our employees because we recognize that every employee plays a vital role in our continued success and prosperity. Process Integrity: To maintain, develop, and improve manufacturing systems that consistently add value and produce defect free products through the application of Total Quality Management and Statistical Process Control. Supplier Relationship: To develop mutually beneficial partnerships with our suppliers and to see each supplier as an extension of Clarke Engineering. Copyright © 2019 Clarke Engineering, Inc.